BHOPAL, Madhya Pradesh, India, June 9, 2010 (ENS) – All seven Union Carbide officials accused in the deadly 1984 Bhopal gas leak were convicted by a court here on Monday, including the former chairman of Union Carbide India Ltd., Keshub Mahindra. After a trial lasting more than 23 years, the magistrate judge sentenced each of the officials to a maximum of two years in prison. All seven have been released on bail. The ruling by Chief Judicial Magistrate Prakash Mohan Tiwari convicted Mahindra, production assistant S.I. Quereshi, production manager S.P. Choudhary, plant superintendent K.V. Shetty, manager J.N. Mukund, vice-president Kishore Kumar and managing director Vijay Gokhale. The eighth man accused, R.B. Roychoudhary, died during the trial. The ninth accused is Union Carbide India Limited. The seven men were convicted of causing death by negligence, culpable homicide not amounting to murder, and gross negligence. 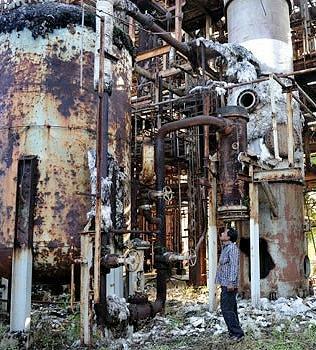 On the night of December 2-3, 1984 a leak of tons of toxic methylisocyanate gas from the Union Carbide India Ltd. pesticide plant in Bhopal killed 3,787 people, according to Madya Pradesh official figures. More than 35,000 people eventually died from the effects of the leaked gas, according to rights activists. Bhopal survivors said Monday that they are resolved to challenge the verdict in a higher court. The verdict was greeted with protests, slogan-shouting and die-ins by irate Bhopalis who defied prohibitory orders to vent their anger outside the court. “By handling those those guilty of the world’s worst industrial disaster so leniently, our courts and government are telling dangerous industries and corporate CEOs that they stand to lose nothing even if they put entire populations and the environment at risk,” said Satinath Sarangi of the Bhopal Group for Information and Action. “The Central Bureau of Investigation failed to produce evidence regarding the role of Keshub Mahindra and other accused in deliberate acts undermining operational safety such as design modification, rewriting of operation manuals and decommissioning the crucial refrigeration unit,” said Sarangi. In a statement, the survivors said that as the minister in charge of the Central Bureau of Investigation, Prime Minister Manmohan Singh must accept blame for the prosecuting agency’s incompetence and mishandling of the case. The Central Bureau of Investigation is controlled by the Department of Personnel of the Union Government headed by a Minister of State who reports to the Prime Minister, although it is administratively part of the Union Ministry of Home Affairs headed by a Cabinet Minister. The survivors say they did not receive justice in part because former chairman and chief executive officer of Union Carbide Warren Anderson, who held these posts during the Bhopal disaster, was never brought to justice. As CEO of the U.S.-based Union Carbide corporation until his retirement in 1986, Anderson was charged with manslaughter in the Bhopal disaster case. 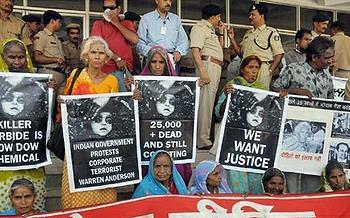 Anderson was arrested and released on bail by the Madhya Pradesh Police in Bhopal on December 7, 1984. He fled to the United States and refused to return to India. He was declared a fugitive from justice by the Chief Judicial Magistrate of Bhopal on February 1, 1992, for failing to appear at the court hearings in a culpable homicide case in which he was named the chief defendant. Magistrate Tiwari issued an arrest warrant for Anderson on July 31, 2009. On Tuesday, former CBI Joint Director B.R. Lall, the senior officer in charge of the Bhopal investigation from April 1994 to July 1995, said on Indian television that the CBI received a written communication from the Ministry of External Affairs instructing it not to proceed with the extradition of Anderson. The activist and survivors organizations say the Prime Minister must accept responsibility for the failure of the CBI in its role as the prosecuting agency. They are calling for the creation of a Special Prosecution Cell for effective and timely action on extradition of foreign accused and prosecution of Dow Chemical, which is the current owner of Union Carbide. The Union Carbide corporation in the United States said in a statement Monday, “By requirement of the Government of India, the Bhopal plant was detail designed, owned, operated and managed on a day-to-day basis by Union Carbide India Limited (UCIL) and its employees. All the appropriate people from UCIL – officers and those who actually ran the plant on a daily basis – have appeared to face charges. In 1994, Union Carbide sold its entire stake in UCIL to MacLeod Russell (India) Limited, which renamed the company, Eveready Industries India, Limited. In 1998, the state government of Madhya Pradesh took over the Bhopal site from Eveready Industries. The convicted former chairman of Union Carbide India Ltd., Keshub Mahindra, is now chairman of Mahindra & Mahindra Ltd., an automotive, financial services and technology company involved in developing electric cars. The U.S. based Reputation Institute recently ranked Mahindra & Mahindra among the top 10 Indian companies in its Global 200: The World’s Best Corporate Reputations list.